Rome's Palatine Hill is one of the famous "Seven Hills of Rome"—the hills near the Tiber River where different ancient settlements once developed and gradually joined together to form the city. The Palatine, one of the hills closest to the river, is traditionally regarded as the founding site of Rome. Legend holds that it was here in 753 B.C. that Romulus, after killing his brother, Remus, built a defensive wall, set up a system of government and started the settlement that would grow to become the greatest power of the ancient Western World. Of course, he named the city after himself. The Palatine Hill is part of the main archaeological area of ancient Rome and is adjacent to the Colosseum and the Roman Forum. Yet many visitors to Rome only see the Colosseum and Forum and skip the Palatine. They are missing out. 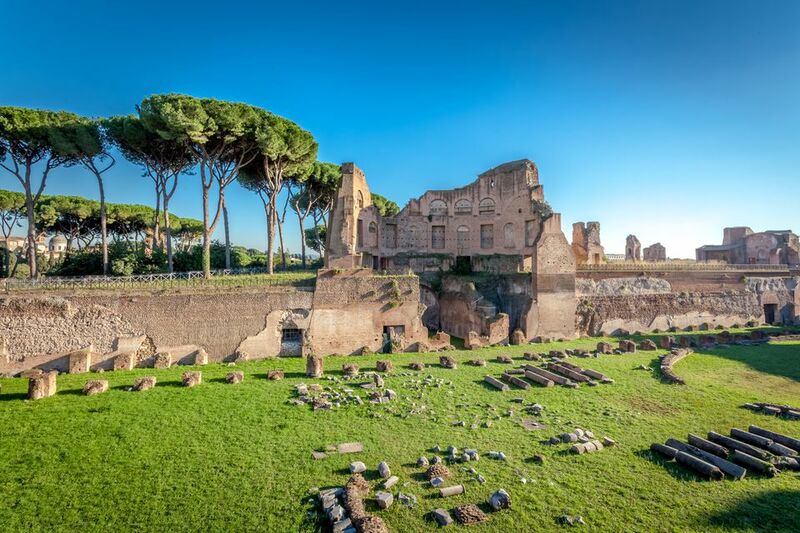 The Palatine Hill is full of fascinating archaeological ruins and admission to the hill is included with the combined Forum/Colosseum ticket. It's always far less visited than those other two sites, so can offer a nice respite from the crowds. Here are some of the most important sites on the Palatine Hill, plus information on how to visit. The Palatine Hill can be reached from the Roman Forum, by bearing left after the Arch of Titus once you've already entered the Forum from the Colosseum side. If you've accessed the Forum from Via di Fori Imperiali, you'll see the Palatine looming large over the Forum, beyond the House of the Vestals. You can take in the sights of the Forum as you head in the direction of the Palatine—you can't really get lost on the way. Our favorite place to enter the Palatine is from Via di San Gregorio, located just to the south (behind) the Colosseum. The advantage of entering here is that there are fewer steps to climb and if you haven't purchased your ticket to the Palatine, Colosseum and Forum, you can buy it here. There's almost never a line and you won't have to wait in the very long line at the Colosseum ticket queue. If you're taking public transportation, the closest Metro stop is Colosseo (Colosseum) on the B Line. The 75 bus runs from Termini Station and stops near the Via di San Gregorio entrance. Finally, trams 3 and 8 stop on the east side of the Colosseum, a short walk to the Palatine entrance. Like many archaeological sites in Rome, the Palatine Hill was the site of constant human activity and development over many centuries. As a result, ruins lay one on top of the other and it's often difficult to tell one thing from another. Also like many sites in Rome, a lack of descriptive signage makes it challenging to know what you're looking at. If you are very interested in Roman archaeology, it's worth it to buy a guidebook, or at least a good map, that offers more information on the site. Otherwise, you can just wander the hill at leisure, enjoy the green space and appreciate the vastness of the buildings there. Imperial Palaces: This vast complex includes the Domus Flavia and Domus Augustana and was the home of Roman Emperors from the time of Augustus to the fall of the Western Empire in the 5th-century A.D. It was expanded and renovated over the years and what remains today are fragments of five centuries or more of construction. Highlights include the Stadium, which may have been used for horse races or as the private garden of Emperor Domitian and the 3rd-century Baths of Septimius Severus, built during one of the last major expansions of the Palace. View of Circus Maximus: From the Palace area, you can wander to the edge of the Palatine Hill and look down over the Circus Maximus, the immense race course below the Palatine. You'll be taking in the same view the Roman emperors enjoyed—they watched chariot races and other spectacles from this perch high above the fray. The Palatine Museum: This small museum contains large sculptures, most of them in fragments, found during excavations on the Palatine. It is free to enter, worthwhile for a quick stop, and there are restrooms here. Houses of Augustus and House of Livia: Emperor Augustus and his wife Livia had side-by-side houses on the Palatine. Both were elaborated decorated with frescoes and mosaics, many of which remain. At the House of Augustus, you can even see the emperor's private study, where he wrote his autobiography, The Deeds of the Divine Augustus, in 14 A.D. Modest guy. You can visit both houses on a combined ticket, but you must reserve in advance and the sites close frequently for preservation and repairs. To find out more, visit the COOP Culture website. The Romulan Huts: Near the houses of Augustus and Livia, you'll see a sign pointing to the Casa Romuli. Make the detour to the far side of the Palatine Hill, closest to the river and you can see what's left of what archaeologists believe is the earliest site of human habitation on the Palatine. Once simple waddle and daub huts covered with thatched roofs, what remains now are post holes and foundations cut into the tufa rock bed. The group of dwellings has been dubbed "The House of Romulus"—though there's no firm evidence that Romulus ever lived here. Still, they represent an important piece of Rome's earliest development. From this vantage point, you can also get a nice view of the dome of Saint Peter's Basilica off in the distance. Cryptoporticus: This 130 meter (142 yards)-long covered passageway was built for the emperors to travel from one palace to the other in relative secrecy and safe from weather and would-be assassins. (This did not work for the despotic Caligula, who was allegedly murdered in this corridor in 41 A.D.) The corridor contains some fragments of vaulted, carved ceilings and on a hot, sunny day in Rome, there's no cooler place to be. Farnese Gardens: Built by Cardinal Alessandro Farnese in the 1500s, the Farnese Gardens were the first private botanical garden in Europe. To the dismay of modern archaeologists, the gardens cover much of what was the Palace of Tiberius and incorporate some of the ruins. Though they are nothing like their former glory, the gardens are still a pretty place to walk around and there are plenty of shady, grassy areas where you can rest and cool off. Be sure to duck into the Nymphaeum, an artificial grotto built to evoke earlier Roman structures. Also at the Farnese Gardens, there are several terraces overlooking the Roman Forum, the Capitoline Hill and beyond. These vantage points offer some of the most iconic views in Rome and are not to be missed. Admission to the Palatine Hill is included in a combined ticket to the Colosseum and the Roman Forum. Since you'll very likely want to visit these sites on your trip to Rome, we strongly recommend you see the Palatine Hill, too. You can buy tickets in advance from the official COOP Culture website or through various third-party vendors. Tickets are €12 for adults and free for those under 18 years of age. COOP Culture charges a €2 per ticket fee for online purchases. Remember, if you don't have tickets in advance, you can go to the Palatine Hill entrance at Via di San Gregorio and purchase tickets with little or no waiting. Wear good walking shoes. The ground underfoot ranges from packed dirt pathways to cement sidewalks to uneven paving stones and roads set in Roman times. There are also stairs in several places. You should be in reasonably good shape for walking, and wear sturdy, comfortable walking shoes. Bring a water bottle. Especially if you visit in the summertime, you'll be walking under the hot sun, often in areas without shade, so bring a refillable water bottle. There are a couple of water fountains on the Palatine Hill where you can refill your bottle but there is no bottled water for sale on the hill. Bring a snack or picnic, but be discreet. Particularly near the Farnese Gardens, there are benches and a few areas where you can plop down on the grass and eat a sandwich you've brought along. However, don't bring a blanket and picnic basket and figuring on lounging for a few hours. Picnicking per se is not allowed on the Palatine Hill, however, no one will chase you off if you stop for a few minutes for a quick bite. Note that there are no food and drink sales on the Palatine Hill, so if you don't bring a snack, time your visit for before or after lunch. Don't try to see all three sites in a day. The combined archaeological area of the Palatine Hill, the Roman Forum and the Colosseum is sprawling, crowded and overwhelming. Don't try to take in all three sites in one day—you'll wind up exhausted and ultimately, won't appreciate what you're seeing. Your ticket is good for 24 hours from the time you enter the first attraction. So if you visit the Forum and the Palatine Hill one day and entered, for example, at 10 a.m., you can see the Colosseum the next day, as long as you enter by 10 a.m. We strongly suggest you break your visit up into two days.